If you haven't figured it out yet, Samsung has impressed me with the Galaxy S III. I was expecting another incremental update in terms of design and features. I was expecting a ho-hum device with little to set it apart from previous generations of devices. Instead, Samsung went for broke and packed the device with features that may lead to mass adoption of burgeoning technology such as NFC. Even if it's used only to share pictures, NFC traction has to start somewhere. 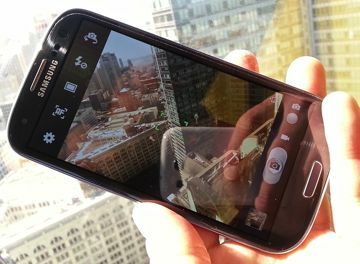 Beyond the bells and whistles, the Galaxy S III is a damned good phone. It excels at nearly every feature. The hardware is the best ever from Samsung and the performance backs it up. The stunning camera and video camera are good enough to record your wedding day, and watching it over and over on the GS3's gorgeous display will make you smile from here until death you do part. Before the GSIII arrived, HTC set the bar this year with the HTC One X. The One X had a few problems, though: specifically voice quality and battery life. The GSIII bests the One X on those and every other feature at least to some degree. Samsung has raised the bar with the Galaxy S III. It will be hard for many other manufacturers to reach it, let alone vault over it. For Android fans, the Galaxy S III is the only phone worth getting. Nothing else comes close.